One of the great, divisive issues within the Corinthian congregation was the practice of spiritual gifts, especially the gift of “speaking in tongues.” It seems many had received this gift and spoke in a kind of “Spirit-language.” Paul doesn’t deny the reality of this gift, but protests the way it is being used within the congregation. It seems those who had the gift considered themselves more spiritual, at a higher place spiritually than those who had not received the gift. Paul, in his wonderful writings on spiritual gifts, reminds the people that there are many gifts and not all are intended to receive each gift. Rather, Paul writes, “faith, hope and love abide, but the greatest of these is love.” It’s no wonder, then, that Paul encourages the Corinthians, saying, “make love your aim ….” For the Corinthians had forgotten this, the greatest of all gifts, and were behaving very unlovingly within their community. I guess we all know that, within every Christian community, there can be unloving behavior. I cringe at the stories I hear when visiting congregations. I’ve heard that at some congregational meetings, tempers have flared and arguments have become so heated that there was name-calling and cursing! Sadly, that’s all too common in Christian congregations. There seems to be increasing tension and division within congregations today. 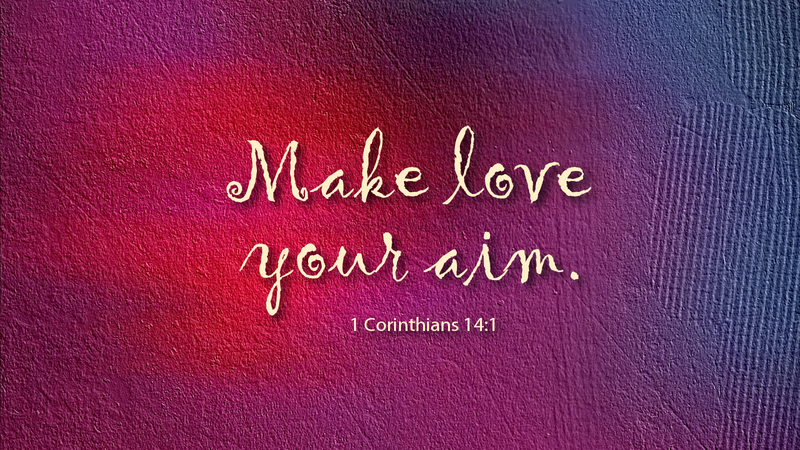 The words of St. Paul, then, speak to us in every age: “make love your aim.” Yes, we are to earnestly desire the spiritual gifts—especially the gifts of faith, hope and love. But the greatest and highest gift, the gift to be desired above all other gifts, is love! If we spend the entire Lenten season simply trying to “make love our aim” wouldn’t that be a Lent well spent? Prayer: Almighty God, help us to make love our aim in all things, at all times; through Christ our Lord. Amen.